As the Pope makes his visit to the USA it is timely to expose the fraud, hypocrisy and downright evil of the Pope and Catholic Church. 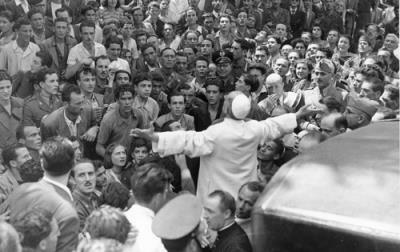 Let us not forget that Popes of both past and present in conjunction with the Catholic church are never in opposition to war and have blessed troops going to wars for hundreds of years. This alone is counter to Christianity and everything Jesus spoke about; but their sins run far deeper. There is the refusal condemn Homosexuality a practice clearly spoken against in THEIR holy text the Bible. Even among their own priesthood homosexuality and pedophilia run rampant. All the while the Pope and church turns a blind eye and pays billions in settlements, hush money and cover ups. Very Christian indeed. There is idol worship everywhere. 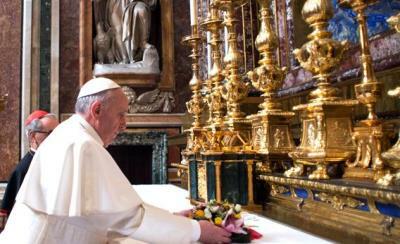 Crosses, statues and saint worship are present in heavily adorned churches. 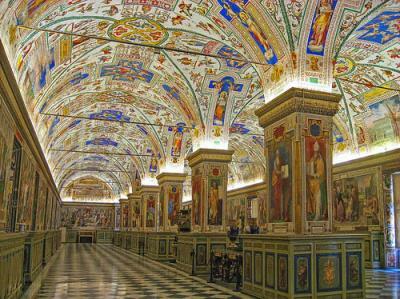 The Catholic church owns billions in property, priceless art and has cash piles to the heavens. Although they wisely do not disclose their wealth, a 2002 investigation by The Economist claimed the church has an estimated of $170 billion in annual spending. 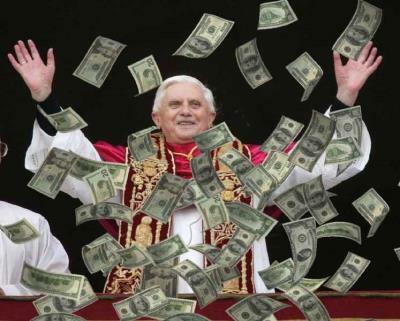 The Catholic Church is one of the biggest and most lucrative BUSINESSES in the world. It is notable to consider the word Pope is never mentioned ANYWHERE in the bible. Like the majority Catholic beliefs, the Pope is non biblical and simply made up. The Pope along with the church are simply the religious arm of the New World Order. Indeed as Karl Marx said "Religion is the opium of the people". It is a handy and convenient way to control 1/3 of the planet. The Pope is simply a man, like any other man. He is not to be revered or honored anymore than any other man and to do so is simply not scriptural and frankly false worship and foolhardy.